Out by us in Ulupinar, no one would ever dream of throwing away a cola bottle. Be it 1 liter, 500 ml or 2.5 liters, these handy bottles are used again and again. They don’t leak, so they are invaluable receptacles for fresh milk, diesel, home made pomegranate or grape syrup, and as I have discovered, great for watering. This is the time of year when we peer at little pots of paper waiting for seeds to germinate. The paper pot, folded out of newspaper, is a wonderful thing. 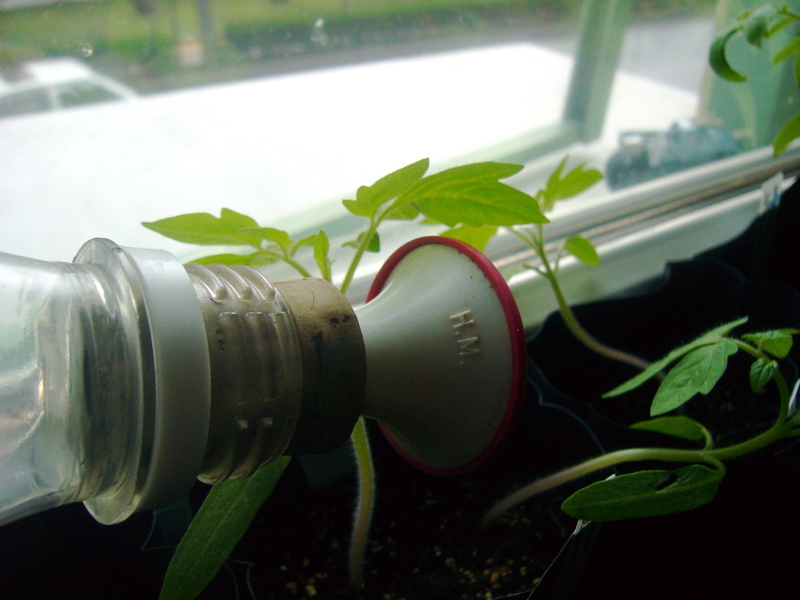 It’s cheap and easy to make, and pretty much any seed can be started in it. One thing that you have to be especially watchful of, though, is that they not dry out. 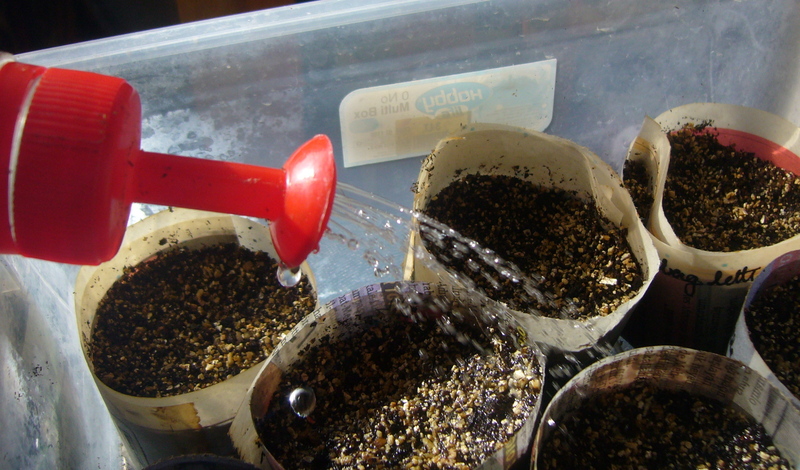 Watering tiny seedlings sometimes no thicker than an eyelash can be nerve wracking, and is best done with a fine shower of water. I used to have a rose for my watering can, but it was detachable, so naturally it got lost. Then I came across a couple of solutions that can be used along with the venerable cola bottle. 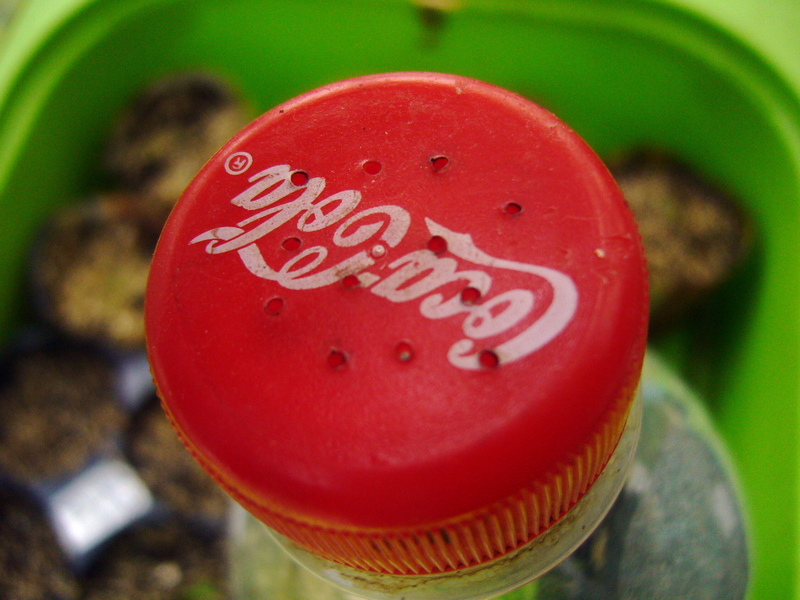 The first is a bottle top that screws on to the cola bottle. I got this from the Thompson & Morgan website when they were giving them away to anyone sufficiently spendy (I have my moments). It is a little fragile, though — I got four of them, and this is the only survivor. Still, it works really well, and it is serving us in the Yellow House as our seed sowing waterer. In the apartment in Antalya, I am starting tomatoes, peppers, eggplants and cucumber seeds in black bags. It is warmer here, since we have heat, and I am using bags so that I can grow them in the bags for a few weeks without worrying about them getting too cramped by the time I can plant them out. I have a little sprinkler cap that I got at years back. It is intended for sprinkling water on your ironing. I don’t iron, so I can’t say whether it works well for that or not, but it makes a great waterer when paired with a cola bottle, and since it’s a cork you could just stuff it into any old bottle. As usual, though, the best answer was staring me in the face. There’s nothing wrong with the bottle cap on the bottle itself. Here’s one that Ali burned holes in with a hot needle (a job best performed in open air, or at least with open window). It works marvelously. Cola may be bad for you, but cola bottles are the gardener’s friend! I LOVE this post…the utility of reusing those bottles instead of throwing them away, and the variety ways they’re put into service is great. Quick, Siobhan – what size needle did Ali use on the bottlecaps??!! Martha and several friends in the neighborhood roll up those newspapers to make seed starters, and they all sport very, very tender shoots. Much discussion centers around gentle watering of the shoots, so those coke bottle watering devices will make good Easter presents. Martha still irons, as she is not quite retired yet. Thanks!